The Peak Resort Dining set up on the hill slop overlooking the verdant mountainous valley is an ultimate dining retreat. With both indoor and outdoor seating, the Peak Resort Dining restaurant will be a perfect venue for a romantic dinner or lunch date. At an altitude of 1210 meters, the Peak Resort Dining has three floors and the glass covered second and third floor offers the panoramic view of the Lembang town and the Mount Tangkuban. The building indoor is adorned with wooden panel on roof and terracotta pillars offering a classic ambience where you can select from an extensive list of wines and cold drinks. At the outdoor room, you will get access to a plethora of mouth-watering snacks and main course items. A very romantic and elegant place to have dinner with the one you love. You can order table near the balcony to have the best view. The food quality is equal with the price you paid. If you like wine, you can have some nice selection of it here. 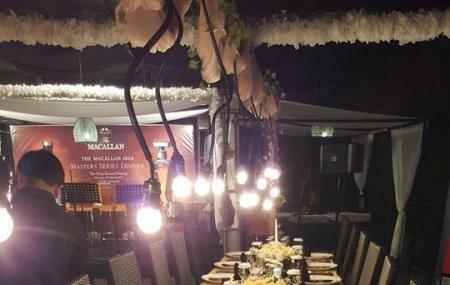 The place, the ambience is very romantic, cozy and elegant. It's a little bit far from city center, but the place is amazing. It's a cozy place with good views. Foods were tasty but little bit pricey. An iconic place in bandung. The place is very beautiful, VERY VERY INSTAGRAMMABLE. Use proper attire when u come to this place, u wont regret it. It is more beautiful at night, and they have live music too (not sure whether it's only on weekends or not). The food is delicious too. Visit it, you wont regret it.